If you still have a perfunctory business card, you know just something thought of at the last minute and maybe even worse; printed out on your computer you’re not taking your business seriously. You know the kind that you punch out of a sheet? You’re missing the point of having a business card. The point is to let someone know your brand and make them curious enough to call you when they need what you have to offer. Business cards are another way to brand your business. You don’t want to be branded like everyone else, boring or worse… standard. Right? 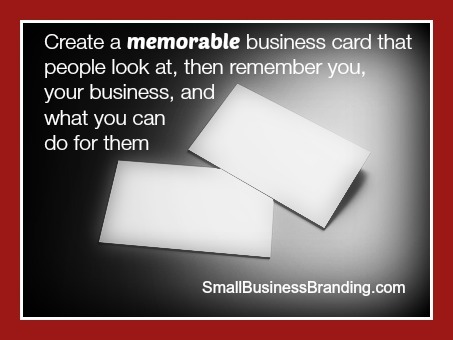 You want business cards that people look at and remember you, your business, and what you can do for them. Consider getting special cards for events and regular cards for other uses. With today’s printing technology you can have your information printed on almost any surface and your business card doesn’t have to be the normal shape or even size. Think outside the card, if you want to get noticed, but you still want the people you meet to be able to carry your card so don’t go too nuts as you don’t want them left behind. Know Your Customer – Before creating any business card design it’s important to understand your customer and what they need to know. Of course your business card needs all the normal stuff on it, how to contact you, your website and so forth. But how can you get through to the person looking at the card that you have what they need? You know who they are and design the card with them in mind. Consider Your Industry – For example if you are serving people in the construction industry how can you make a card that appeals to them? This is an excellent way to think outside the card and create a card that is either 3D or can be constructed into a 3D card by the receiver later. The card again, needs to appeal to your ideal client more than to you. Start With Your Logo – You probably already have a logo, which can be how you start your business card design idea. You want to keep this the same throughout your business card design too, but also make it stand out. If you don’t have a logo yet, this is your chance to really think outside the box and come up with something new. Match The Brand You Currently Have – If you already have a lot of marketing collateral you likely already have colors, fonts, tag lines and what not. You still want people to know it’s you, but you want them to be impressed by your card which will make them impressed by your business too. Plus, it’ll ensure that they really look at it and take notice. A good business card will tell your audience who you are, what you can do for them, and how to find you. It will do all this with the right fonts, the right colors and the right designs that will stand out so that they won’t soon forget you. You can use a standard card, or you can think outside the card and use other materials. It’s up to you. Don’t be afraid to get creative so that you can be remembered and get noticed. I have a friend who owns a chocolate shop, her business cards are chocolate, and they’re okay to eat because they’re wrapped with the right information which is also printed on the chocolate. However, the final thing that’s most important about a business card is to actually give it out at events. So many opportunities can arise whether you’re at an event or not. You might even meet someone while waiting on line at the grocery store or in the doctor’s office. Have your cards ready to give out and give them out liberally to get the most from them. If you feel like reading some more here are some awesome examples of non-traditional business cards that might spark your creativity. One of the most clever usable business cards shown here is also a cheese grater. As you can imagine something like this would be quite expensive, but at the right event you won’t soon be forgotten. People would actually get use from it and think of you each time. On the more practical side I love the tearable divorce business card. You can tear it and offer it to a friend, while keeping the information for yourself. Tearable business cards can be used for all sorts of business and won’t really be that much more expensive. Your customers, and those to whom you offer such a card can easily share with others. Many of these examples aren’t totally efficient for every day, but they work great at events to help make you stand out. 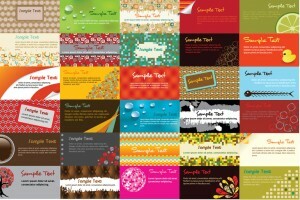 What’s more is that you can carry over some elements of the design to your regular business card for normal use. Entrepreneur.com says that you should copy other people’s business cards and stay standard to your industry. I don’t necessary agree. I think you should do what you can to stand out and get noticed within your budget. What does your business card look like? I’d love to see them if you have created something different. Thanks for the post, Stephanie. As much as business cards have shifted in purpose, they are still necessary! I think those of us who work online especially miss the importance of business cards in building our brands. But, I have managed to obtain a lot of local business due to having a card that I give out anytime anyone wants my name and phone number. It still works great. I also have a QR code on my business card so they can easily check out my website. Stephanie, great article on business cards and the importance of as well. You’re absolutely right when you say online companies do not use this method enough. As you have, our company has did well with our responses to business cards. Some people underestimate the reach of business cards and the fact that it’s a great marketing tool. Now that I use business cards more effectively (anytime I leave the house even while waiting in line at the supermarket and once at the doctor’s office) it’s paid off.